The Seychelles Island group was part of the southern supercontinent Gondwanaland before the latter broke apart. It then split away from India 60 million years ago and has been isolated from all continents ever since. 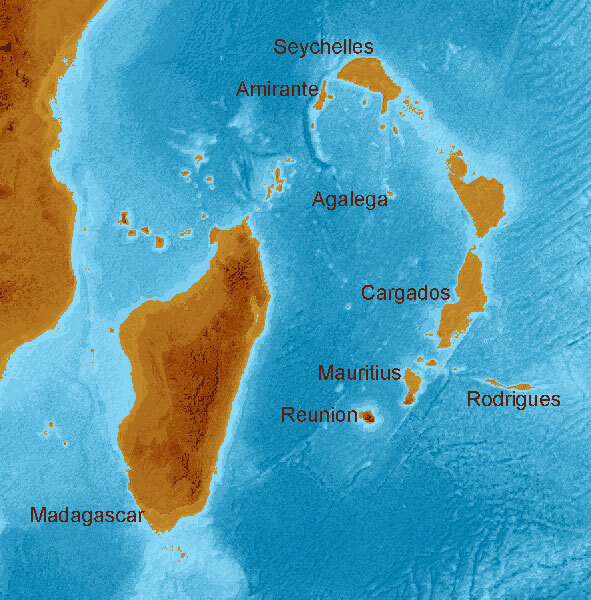 Presently, the Seychelles Islands include separate mountaintops totaling about 282 square miles, but during the last Ice Age it was 1 giant island of about 80,000 square miles…roughly the size of Georgia and half of Florida combined. Sea level rise has inundated most of the island. The Seychelles Islands are located northeast of Madagascar. They are mountain tops of a large desert island that existed during Ice Ages. 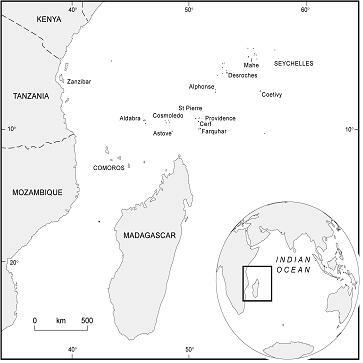 Map of Seychelles and other islands during the Last Glacial Maximum ~29,000 BP-~15,000 BP. A human seafarer wrecking his boat on the Pleistocene Seychelles would have discovered both a deserted and a desert island that could have inspired the setting of Robinson Crusoe. The Seychelles Island was drier with a more sparse tree canopy than is found on the island group today. A giant species of tortoise (Aldabrachelys gigantea) shaped the landscape into a short grass plain known as “tortoise turf.” This long lived species (a captive specimen reached the age of 255) still occurs on 1 of the Seychelles atolls. The Aldabra tortoise creates pathways and selects for shorter species of grasses that grow below its preferred level of foraging. Primitive amphibians closely related to species found in India occur on the Seychelles. Caecilians and soogloossid frogs live here. The presence of these primitive amphibians on India and the Seychelles provides biological evidence that they were once part of the same land mass. 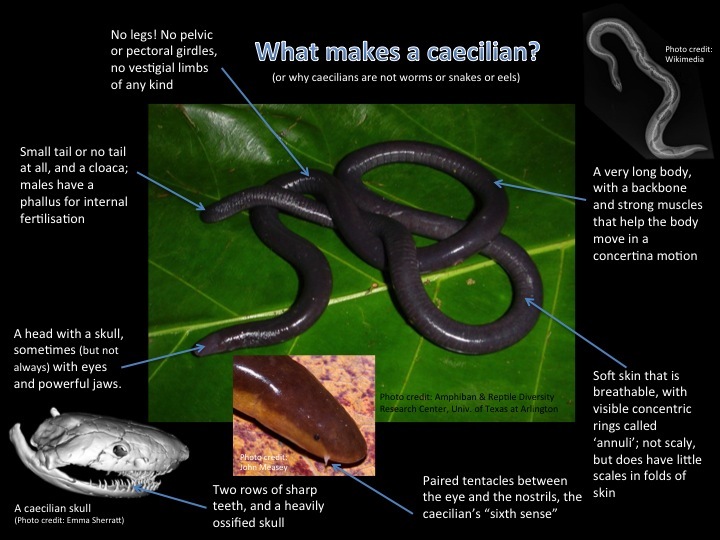 There are 5 species of caecilians living on the Seychelles. They are primitive amphibians. The only dangerous animal for a Pleistocene Robinson Crusoe stranded on the Seychelles would have been the Australian saltwater crocodile (Crocodylus porosus). Early European explorers reported them as “abundant” on the Seychelles, but they were extirpated here by 1819. 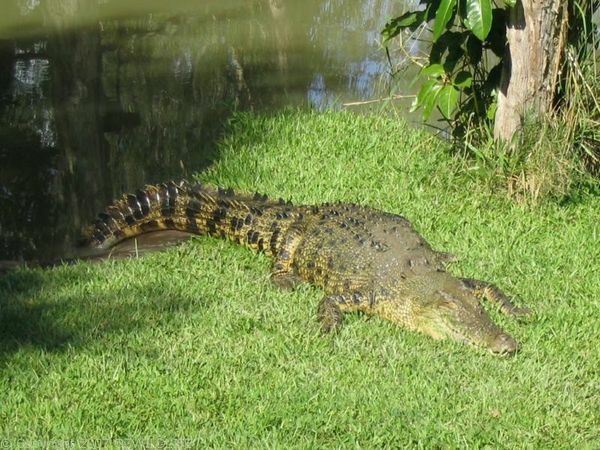 Naturalists wrongly assumed they were African species–either Nile crocodiles or mugger crocodiles. But a genetic study suggests they were the Australian species. These saltwater crocodiles occasionally do swim miles into the ocean and surface currents helped carry them to the far away Seychelles. Australian saltwater crocodiles lived on Seychelles until 1819. At least 238 species of birds live on the Seychelles. More species than that probably lived on the island before the Indian Ocean submerged most of it. Sea birds like nesting on islands where few predators roam. Many species of migratory songbirds get blown off course and learn to survive on islands. Some evolve into new species. Pigeons are notorious for getting blown out to sea. The Seychelles has 5 different species of pigeons. Settlers wiped out 1 species of parrot (Psitticula wardi) native to the Seychelles. A fruit-eating bat known as a flying fox is the only native species of mammal on the island group. The Seychelles Parakeet is now extinct. The coc-de-mer coconut palm (Ladoica maldivica) would have provided plenty of food for a stranded Pleistocene Robinson Crusoe. It produces the largest seed in the world, weighing 50 pounds. Unlike other coconuts, this species doesn’t float, explaining why it occurs nowhere else. They produce a toxin that prevents other plants, including competing members of their own species, from growing near its root system. These slow-growing plants take 800 years to reach full size. 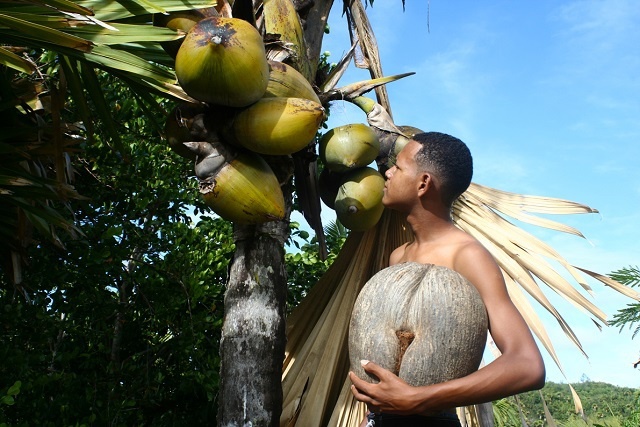 The coco-de-mer coconut palm is the largest seed in the world, growing to over 50 pounds. 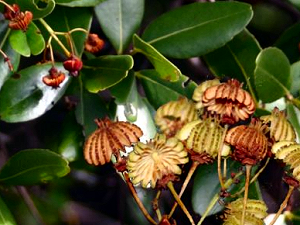 The jellyfish tree (Medusagayune oppostifolia) is a rare species living on the granite mountaintops. This relic was likely widespread over the Seychelles before the Indian Ocean inundated most of it. The jellyfish tree is a rare relic that was probably more widespread on Seychelles during Ice Ages. The ratites are ground dwelling birds that originated on the supercontinent of Gondwanaland before it split apart. The ratites include the kiwi bird of New Zealand, the cassowary of New Guinea and northern Australia, the emu of Australia, the rhea of South America, penguins of Antarctica, and the ostrich of Africa. About 10 million years ago, Africa collided with Eurasia, allowing ostriches to expand their range north. The fossil record suggests ostriches occurred on the Himalayan Highlands from the Miocene until the mid-Pleistocene. During the late Pleistocene ostriches shifted their range south and lived in western and central India. Ostriches disappeared from India about 10,000 years ago and are now confined to Africa. Ostriches belong to the ratite family along with emus and cassowaries. They evolved on Gondwanaland before Australia, Africa, Antarctica, and South America broke apart. Ostriches colonized Asia and occurred in India during the late Pleistocene but became extinct there about 10,000 years ago. 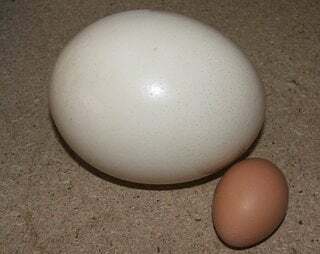 Ostrich egg compared to chicken egg. Ostrich egg shell fragments dating to the Pleistocene are more common in India than the actual ostrich bones. Ostriches prefer a type of habitat known as the Sahel. Sahel vegetation grows on semi-arid tropical steppe and consists of grassland and savannah with some woodland and shrub land. A latitudinal band of Sahel vegetation currently exists between the Sahara desert and the Sudanese savannah. The presence of ostriches in the Asian fossil record suggests Sahel-like vegetation existed in the Himalayan Highlands for millions of years. Sahel-like landscapes predominated in central and western India from over 60,000 years ago to ~10,000 BP. Habitat on the Himalayan Highlands may have deteriorated into pure desert during severe glacial episodes, and ostriches used the Indus River corridor as a route to central India. 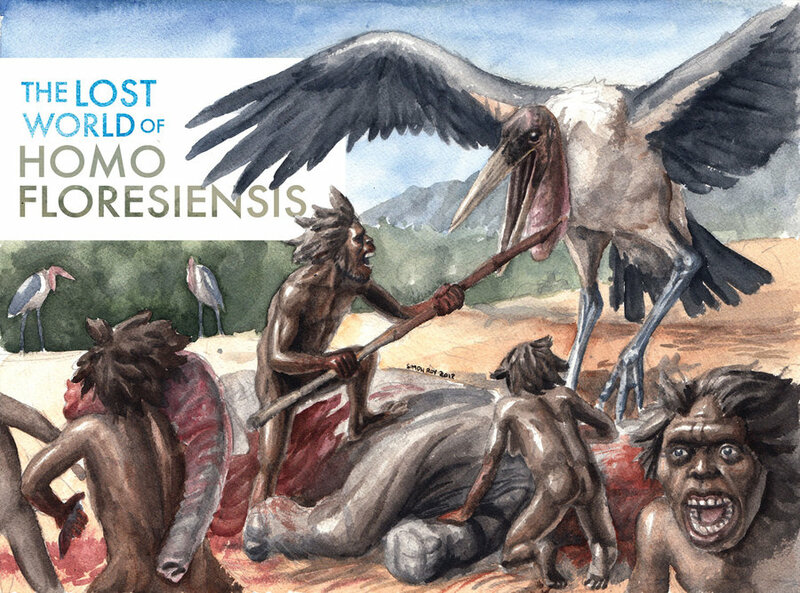 Ostriches and humans (Homo sapiens) were the only new large vertebrates to colonize this region during the late Pleistocene. Most anthropologists believe humans first colonized India by following a coastal route, but people may have used the Indus River corridor to colonize India from the Himalayan Highlands instead. 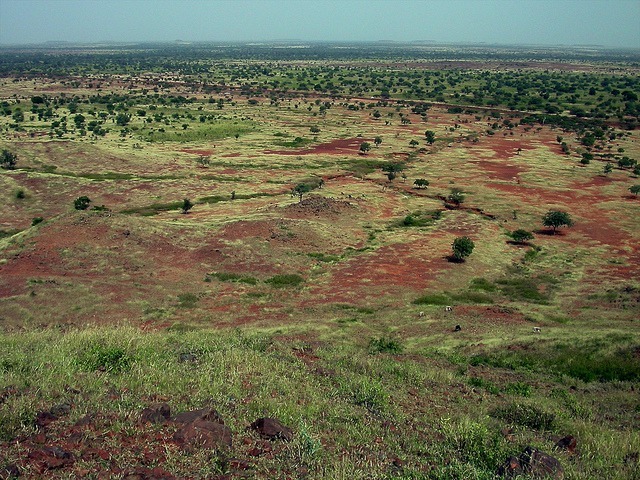 Photo of Sahel-vegetation, the favored habitat of the ostrich. The Sahel belt is a zone between the Sahara desert and the Sudanian savannah. Habitat like this was common in India during the late Pleistocene. Other species of large vertebrates that prefer Sahel-like vegetation still occur in India. Lions, wild asses, and rhinos still find suitable habitat in India but it occurs in patches. The shift from glacial to interglacial vegetation patterns may not explain the disappearance of ostriches from India because grasslands and savannah still exist there. Humans may have overexploited ostriches. Archaeologists have found beads made with ostrich eggshells and ancient rock paintings of the big birds in India. India did not suffer a major extinction event at the end of the Pleistocene. A study of 21 Pleistocene mammals determined just 1 species, a baboon, became extinct then. Baboons are highly adaptable apes that directly compete with humans for the same resources. I believe humans are behind the extirpation of baboons and ostriches from India. Tropical diseases kept human populations low, however, and other species of megafauna were able to survive human impacts. Later, the Hindu prohibition against killing became popular, helping to protect animal populations. The Hindu religion may be as old as 7000 years, beginning at a time when India was still a vast wilderness. Scientists can’t determine what species of ostrich lived in Pleistocene India. It may have been a unique species or the same still extant in Africa. Ostrich egg shell fragments are far more common at fossil sites than the actual ostrich bones. During warm climatic phases of the Pleistocene, the north polar ice cap mostly or even completely melted. The Arctic Ocean became an ice free corridor when interglacial summers were warmer and longer than those of the 21st century. Many species of marine mammals used this ice free corridor as a migratory route between the Atlantic and Pacific Oceans. A study of gray whale genetics suggests the gray whale enjoyed a gene flow between Atlantic and Pacific populations until the Last Glacial Maximum when the polar ice cap expanded and blocked the Arctic Ocean corridor. It remained blocked from about ~30,000 BP-~10,000 BP. Then, the corridor began opening intermittently and there was some mixing of populations early during the Holocene. Human hunters extirpated the Atlantic population of gray whales by 1620. 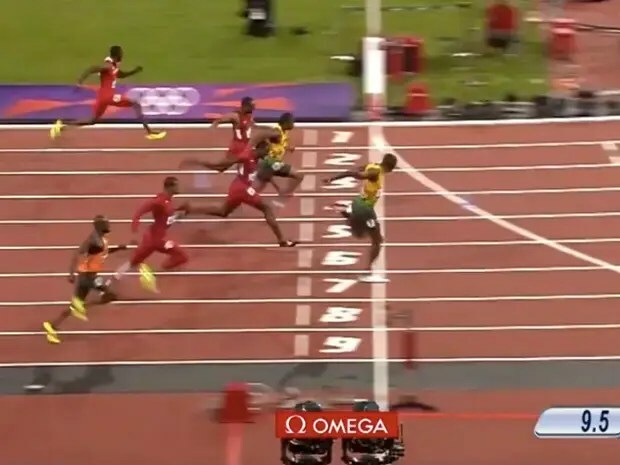 It’s amazing how fast this was accomplished. Whalers eliminated this population about a century after bringing their hunting technology to the American side of the ocean. 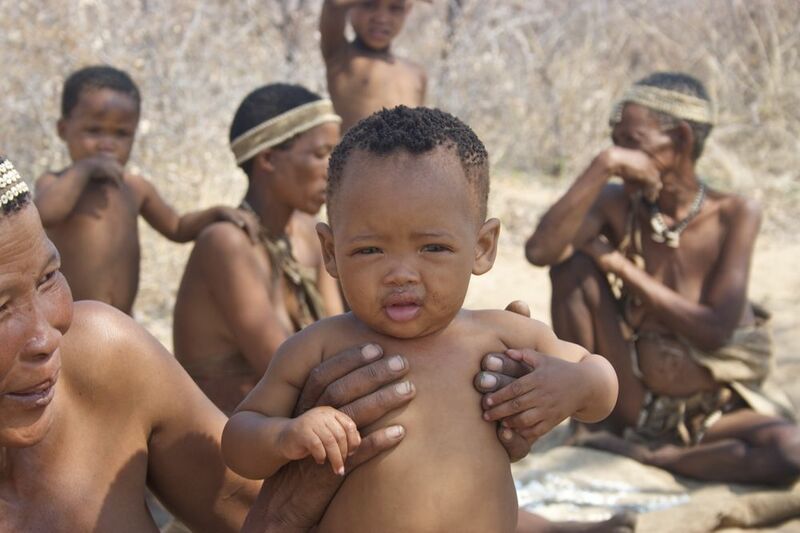 Humans almost overhunted the Pacific population into oblivion, but laws outlawing the practice saved the species, and populations are on the rebound. Present day global warming is causing the Arctic Ocean corridor to open intermittently again. Gray whales are using this corridor again and have recently been spotted in the Atlantic Ocean. Gray whales may recolonize the Atlantic Ocean because of global warming. Human divers discovered fossil evidence of gray whales off the coast of Georgia. A gray whale jaw and jaw fragments from another individual were found on JY Reef located to the east of St. Catherine’s Island. Today, this site is in deep water, but at the time these whales died, it was a shallow shell bed located near the shore. One of the specimens dates to 41,000 BP, and the other was found embedded in oyster shells dated to 48,000 BP. The vertebrae of an unidentified species of whale was also found here. Some scientists hypothesize gray whales used the warm waters off the Georgia coast for breeding and calving, much like the small surviving population of right whales (Eubalaena glacialis) does today. Killer whales probably hunted the whale calves as seen in the below video. Gray whales migrate to cooler waters to feed. During cooler phases of the Pleistocene this migratory route may have been shorter. Video of a mother gray whale protecting her calf from a >2 hour killer whale attack. Scenes like this likely occurred off the coast of Georgia until ~1620 AD. Scientists are searching the continental shelf off the coast of Georgia for subfossil evidence of the gray whale barnacle, Cryptolepes rhachianecti. This would be additional evidence for the former presence of gray whales here. Gray whale barnacles. Gray whales help spread the species and provide protection from predators such as starfish, sea worms, and fish. Gray whales survived the climatic fluctuations of the Pleistocene, but in the Atlantic they couldn’t withstand 100 years of human hunting. Alter, S. Elizabeth; et. al. Studies of bone chemistry suggest the species of North American llamas that lived in North America during the Pleistocene enjoyed a diet similar to that of the white-tailed deer (Odocoileus virginianus). The species of llamas that co-existed with deer then were the large-headed (Hemiauchenia macrocephala) and the stout-legged (Paleolama mirifica). Evidence determined from the below referenced studies suggests the large-headed llama preferred open woodland habitat because it was a mixed feeder capable of grazing grasses and browsing on trees and shrubs. One scientist thinks they may have grazed on green grass during the summer and browsed on woody vegetation during the winter. In any case it was a very adaptable species with a wide geographic and temporal range, having existed for over 2 million years. The stout-legged llama was a denizen of deep forests, dependent upon browsing the plant foods found in shady environments. White-tailed deer are also browsers that prefer deep forest and forest edge. I’ve considered the ecological interrelationship between Pleistocene llamas and deer and have reached some hypothetical conclusions about the former abundance and distribution of each species. 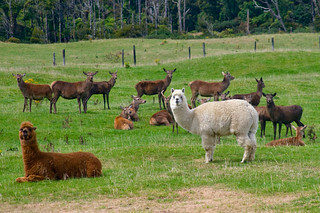 Llama and deer on a farmed ranch. Llama and deer co-existed in southeastern North America during the Pleistocene and consumed many of the same plant foods. Llamas are closely related to camels. 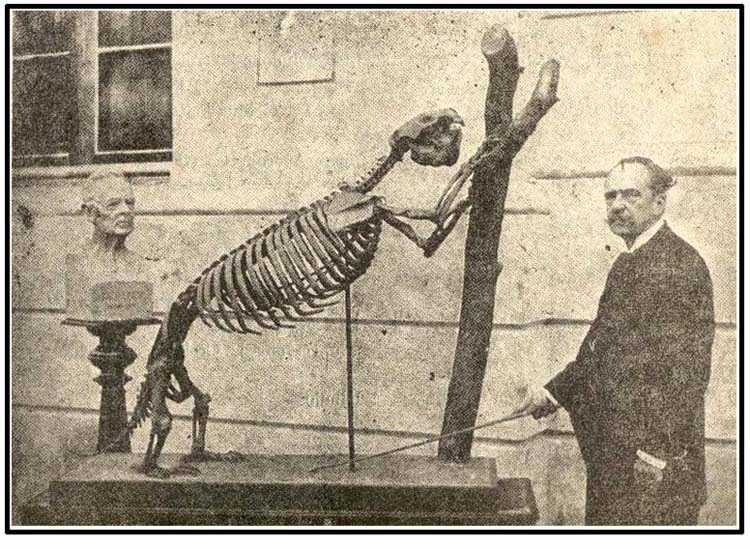 The large-headed llama was probably far more abundant in Florida during the Pleistocene than white-tailed deer based on the abundance of each in the fossil record. The former species has been found at over 60 fossil sites in Florida. Remains of this species have been found off the coast of Georgia (which was above sea level during glacial episodes) as well as the coastal plains of South Carolina and Texas. The large-headed llama also ranged from southern California north to Washington, Idaho, South Dakota, and southern Canada. Their range included Oklahoma, Kansas, and Nebraska as well. Curiously, no certain remains of this species have been found from central Georgia north to Wisconsin and Maine. Clayton Ray, former curator for the National Museum of Natural History, commented that a partial tooth found at Ladds in Bartow County, Georgia resembled a “camelid” but was not enough evidence to definitely state the presence of llamas there. Based on the geographical occurrence of this species’ remains and isotopic evidence suggesting it preferred open woodlands, I’ve concluded its Pleistocene range extended from western North America to the southeastern coastal plain and Florida. Many species of western plants are found on the southeastern coastal plain where they occur as relics, and this is evidence an ecologically similar corridor once connected western prairies to southeastern savannahs. The large-headed llama likely was a common animal of long-leaf pine savannahs that formerly prevailed on southeastern coastal plains. Their fossil remains are so common at the Harleyville fossil site in South Carolina that it is known as “camelot.” This site dates to 400,000 years ago before bison colonized the region. Llamas had even less competition for food during the middle Pleistocene. White-tailed deer and long-nosed peccaries (Mylohyus nasatus) were likely the most common hooved animals in north Georgia during the late Pleistocene based on their abundance in the fossil record here. This is evidence that forests grew more dense to the north of the coastal plain. There is not enough fossil or pollen evidence to determine where exactly in the piedmont forests began to become more dense. The latitude where the density of the canopy increased from open woodland to closed forest fluctuated depending upon climatic cycles and other factors. Despite the lack of fossil evidence, I believe large-headed llamas occasionally ranged into the piedmont and mountain regions of the south whenever habitat became favorable. They advanced wherever forests became more open. But deer were probably more common than llamas in the upper south for most of the Pleistocene. Fossil remains of the stout-legged llama seem to be restricted to Florida and the coastal plain of Texas south to South America. This suggests the stout-legged llama was not as cold tolerant as its cousin. Instead, they preferred warm sub-tropical forest. Both species of North American llamas were 2 to 3 times larger than white-tailed deer. Large-headed llamas grew to 660 pounds, while stout-legged llamas reached 600 pounds. Their larger size meant they reproduced more slowly than white-tailed deer and were less able to withstand human hunting pressure. Changing climatic conditions could not have caused their extinctions because the foods they ate always remained abundant. White-tailed deer populations, especially in Florida but wherever their ranges overlapped, increased following the extinctions of llamas because they no longer had to share the edible plant material the environment provided. You are currently browsing the GeorgiaBeforePeople blog archives for September, 2015.